Wilson's Wedding Chapel offers the perfect venue for a romantic indoor wedding. Offering seating for up to 150 guests and a stage for the Bride & Groom, officiant, and attendants. A Wedding in the Chapel offers the soft, romantic glow from aisle and stage candelabra. Wedding chapel is equipped with microphones and a sound system for the ceremony and music. We offer Wedding Chapel Packages to suit every budget. An adjoining Reception Hall allows more time for you and your guests to mingle and relax. 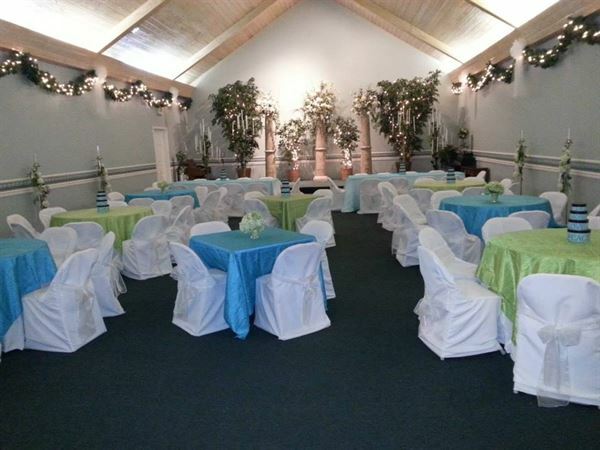 After the ceremony, our staff can convert the wedding chapel into a seated banquet hall for a more formal reception. Offering seating for up to 150 guests and a stage for the Bride & Groom, officiant, and attendants. A Wedding in the Chapel offers the soft, romantic glow from aisle and stage candelabra. Wedding chapel is equipped with microphones and a sound system for the ceremony and music. Get married in a beautiful outdoor setting under a romantic Victorian gazebo. The expansive outdoor space allows for more than 150 guests. Elegant wooden chairs adorn the courtyard for your guests. Outdoor tables with white tablecloths provide an inviting seating area for reception guests. Courtyard is equipped with microphones and a sound system for your ceremony music and vows. An adjoining Reception Hall allows more time for you and your guests to mingle and relax. After the ceremony, our staff can convert the wedding chapel into a seated banquet hall for a more formal reception (additional fees apply).